Customer Service Department of Amtron Technology, Inc. Please contact our service department by E-mail at service@amtron.com , Phone (323) 265-8076, or Fax (323) 488-9747. Drive bays of a computer are commonly used to house data storage devices such as CD & DVD drives, floppy or Zip drives, etc. Drive bays can also be used for front-end card readers, USB ports, I/O bays, and other uses. 5.25" drive bay is the standard housing for CD or DVD drives in modern computer, but is sometimes used for other devices. Its name does not refer to the width of the bay itself, but rather to the width of the disks used by the drives which mounted in the bay. Its dimension is approximately 1.75" high by 5.75" wide. It is better-known as 5.25" (5¼-inch) bay in comparison with 3.5" bay. 3.5" drive bay is generally used for floppy or Zip drives. 3.5" (3½-inch) drive bay, like its larger counterpart, is named for diskette dimension. Its actual dimensions is 4" wide by 1" high. When installing a device in a drive bay, it is usually secured with 4 screws that hold the device in the bay. There are adapters, sometimes called "3.5"-to-5.25" mounting kit" or "sled", which can be used to mount a 3.5" device in a 5.25" drive bay. Then, any necessary power and other cables are routed into and connected to the rear of the device. The drive bay is usually just big enough for the device to fit inside. 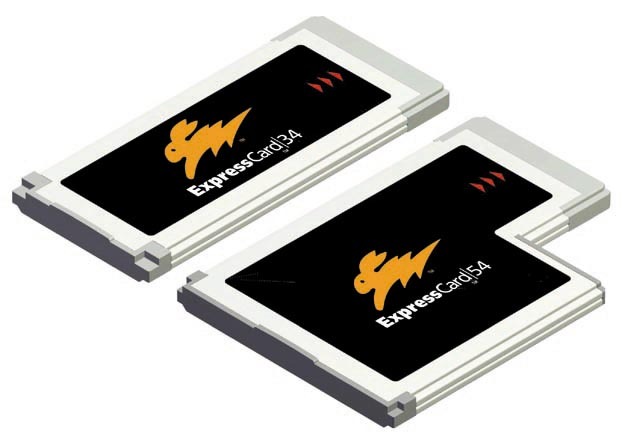 There are two standard formats of ExpressCard modules: the ExpressCard/34 module (34mm x 75mm) and the ExpressCard/54 module (54mm x 75mm). Both formats are 5mm thick, the same as the Type II PCMCIA PC Card. The standard module length is 75mm, which is 10.6mm shorter than a standard PCMCIA 16-bit PC card or 32-bit CardBus PC Card. 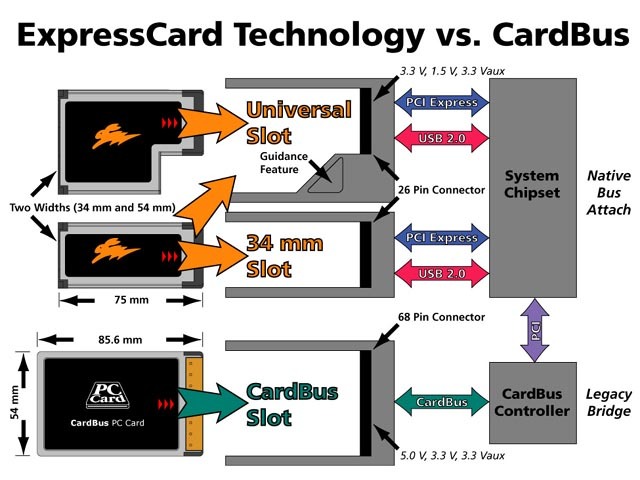 Both ExpressCard module formats use the same connector interface. The two ExpressCard module sizes give system manufacturers greater flexibility than in the past. While the ExpressCard/34 device is better suited to smaller systems, the wider ExpressCard/54 module can accommodate applications that do not physically fit into the narrower ExpressCard/34 form factor. Examples include SmartCard readers, CompactFlash card readers, and 1.8-inch disk drives. In addition to extra space for components, ExpressCard/54 modules can dissipate more thermal energy than the smaller module, making it a natural choice for higher performance and first generation applications. The slot for the ExpressCard/54 module also supports an ExpressCard/34 module. The wide slot features a novel guidance mechanism that steers ExpressCard/34 modules into the connector socket. 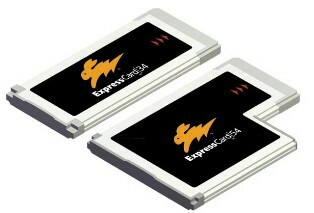 The ExpressCard Standard also allows extended module formats to integrate features such as LAN and phone line connectors, or antennas for wireless cards into their products. Although PCMCIA CardBus PC Cards and ExpressCard modules are not designed to function in the same slot, inserting a PCMCIA 16-bit PC Card or 32-bit CardBus PC Card into an ExpressCard slot or vice versa will not cause any damage to either part. PCMCIA CardBus slot supports both 16-bit PCMCIA PC Card or 32-bit PCMCIA CardBus PC Card. However, a 16-bit PCMCIA PC Card slot can not support 32-bit PCMCIA CardBus PC Card. PCI is acronym for Peripheral Component Interconnect. The PCI specifies a computer bus for attaching peripheral devices to a computer motherboard. The PCI expansion slot is a local system bus standard and is common in modern PCs, where it has displaced ISA and VESA Local Bus as the standard expansion bus. PCI slots are found in both PCs and Macs. The PCI bus will eventually be succeeded by PCI Express. 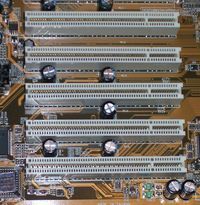 PCI slots allow numerous types of expansion cards to be connected inside a computer to extend the computers functionality. Examples of PCI expansion cards are network card, graphics card, sound card, etc. PCI Express (PCI-E or PCIe) is a computer expansion card interface format introduced by Intel in 2004. It was designed to replace the PCI expansion bus, the PCI-X bus, and the AGP interface. Unlike previous PC expansion interfaces rather than being a bus, it is structured around point to point full duplex serial links called lanes. In PCIe 1.1 each lane (the most common version as of 2007) carries 250 MB/s in each direction. PCIe 2.0 doubles this and PCIe 3.0 doubles it again. 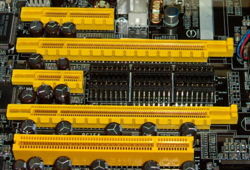 Each slot carries one, two, four, eight, sixteen or thirty-two lanes of data between the motherboard and the card. Lane counts are written with an x prefix e.g. x1 for a single lane card and x16 for a sixteen lane card. Thirty-two lanes of 250MB/S gives a maximum transfer rate of 8 GB/s (250 MB/s x 32) in each direction for PCIe 1.1. However the largest size in common use is x16 giving a transfer rate of 4 GB/s (250 MB/s x 32) in each direction. Putting this into perspective, a single lane has nearly twice the data rate of normal PCI, a four lane slot has a comparable data rate to the fastest version of PCI-X 1.0, and an eight lane slot has a data rate comparable to the fastest version of AGP. PCIe slots come in a variety of sizes referred to by the maximum lane count they support. A larger card will not fit in a smaller slot but a smaller card can be used in a larger slot. a slot of a large physical size (e.g. x16) can be wired electrically with fewer lanes (e.g. x1 or x8) as long as it provides the power and ground connections required by the larger physical slot size. In both cases, PCIe will negotiate the highest mutually supported number of lanes. It is not possible to place a physically larger PCIe card (e.g. a 16x sized card) into a smaller slot, even though the two would be signal-compatible if it were possible. 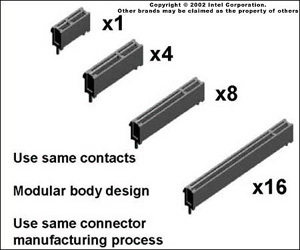 The mechanical (physical) board connectors come in one of four types: x1, x2, x4, and x16 (see illustration above) in order to meet different peak bandwidth requirements. If your computer's Windows XP or Vista operating system fails to install the Windows built-in PCMCIA driver, please click here for driver issues. If you have problem with Compaq Deskpro EN, EN (SFF) and EN (SFF-v) Series computers, please upgrade your BIOS (686P2/P3 ROM) from http://www.compaq.com/ . If BOIS upgrade does not help, please try to insert the PCI interface card to the # 3 slot from the CPU (the #1 or #2 slot is the 2nd choice). This may resolve some Compaq models' problems. For Dell Dimension 4100 and other PCs using Intel 815 chipset motherboard, please upgrade your BIOS to version 06. If a 32-bit Cardbus card is used, Windows 98SE may not automatically detect it. Please go to control panel to "Add Hardware", then the card will be detected. (2) If the drivers for older Windows 95 /98 /98SE /ME /2000, supplied in the package, were installed by accident, please uninstall it. Otherwise, these drivers will cause conflicts with the Windows XP/Vista native PCMCIA driver. (3) In some rare cases, the Windows native PCMCIA drivers are not present in the system since end users purchase computers from vendors with Windows XP or Windows Vista pre-installed and the CD-ROM (a restore disk) they get with their system is not a full copy of Windows although they paid in full for Windows. The end users need to contact their computer system vendor and tell them that they need the "signed Microsoft Windows XP/Vista drivers for the PCMCIA controller CB1410, R5C475II, R5C476II, R5C485, R5C486, PCI1410, PCI1510, TI1225, .. etc." depending on which controller their PCMCIA PC Card Reader/Writer uses. The drivers may already be on a computer system in "C:\\WINDOWS\system32\DRIVERS\pcmcia.sys", and instructing the installation routine to that file may help. If an end user has a retail CD-ROM of the Windows XP or Windows Vista installation disk, then this isn't an issue. Simply inserting the CD-ROM during the new hardware found routine will allow Windows to find and install the correct drivers. For further helps, please send e-mail request along with your invoice number to service@amtron.com. Insert P2 Card in the card slot of card reader. Install the P2 Card Driver supplied by Panasonic. Follow the installation procedure described in the P2 Driver Install Manual which can be obtained from the Panasonic website. PCMCIA SRAM PC Card does not come with drivers. Asking SRAM Card or Card Reader vendors to provide SRAM drivers for computer operating system is like asking drive and disk manufacturers to provide drivers for floppy disk or CD. It is the operating system (OS) vendor's responsibility to include support for SRAM PC cards. Unfortunately, SRAM drivers traditionally included in Windows distributions are not included in Windows XP. The following process shows a work-around method to get Windows XP to recognize and use SARM PC Cards with attribute memory. It does not seem to work with SRAM PC cards without attribute memory. Be certain your Windows XP is up to date with the latest Service Packs and the host computer system supports PCMCIA PC Cards. Please note that we provide this work-around as a customer service and do not guarantee it will work with every computer system configuration. For the best solution please see Third Party Software Packages for SRAM PC Card at below. You can also purchase an external PC Card Reader, such as one of the CSM GmbH OmniDrive USB2 PC Card Readers, to read/write SRAM cards. These USB PC Card Readers read and write both types of SRAM cards (without and with the attribute memory). If the work-around method does not work, the end user may consider purchasing a third party PCMCIA support software package. There are several to choose from and the following list is provided as a service, not a recommendation or endorsement. IPI SoftDrive Professional PC Card Storage Device Software is powerful, extensive and well supported PCMCIA Memory Card software for use with laptops with built in PC Card slot. Elan Digital Systems MCE is PCMCIA Memory Card software for use with laptop slots or PCI based card readers. SystemSoft Corporation publishes several packages, including ones that support WinNT, Win2k (2000) and WinXP.